Here is a very good Google Forms resource we discovered through @Google For Education. 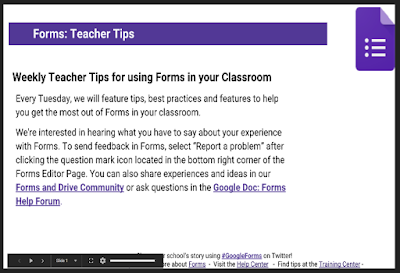 This is basically a presentation comprising 52 slides each of these slides features a Google Forms tip shared by a teacher or educator on Twitter. Teachers are asked to use #GoogleForms handle to share their own experiences using Forms in their instruction and the folks in Google for Education collect and organize these resources into presentations such as the one below. The educational strength of these tips is that they come from fellow teachers who have already tried them out in their own context and you will only have to re-appropriate them to suit your own teaching needs. The slides contain dozens of creative ideas and hands-on activities that will help you make the best of Google Forms in your teaching. For instance, you will get to know how to: create a digital reading log for your students, create and distribute quizzes to your class, view Forms responses in 4 different ways, customize the settings of your Forms, create a bottle flipping lesson, display images and videos in your Forms and many more. Check out the presentation by clicking on the image below and make sure you share with the community your own experiences using Forms in your class. The same thing for Google Classroom. There is a presentation which you can access from this page featuring over 50 tips on how to use Google Classroom for a variety of teaching and learning purposes. Again these tips are shared by teachers using Twitter handle #GoogleClassroom. You can use the same handle to join the conversation and share your own experiences using Classroom.